Thank you for your interest in doing business with the Clay County Sheriff’s Office (CCSO). The two main points of contact for doing business with our agency are the CCSO Purchasing Section and the CCSO Civil Section. The main objective of the Clay County Sheriff’s Office Purchasing Section is the acquisition of quality goods and services at the lowest cost. We are constantly seeking new sources of supply. The Clay County Sheriff’s Office welcomes your participation in these efforts and promises to treat all vendors fairly. Pursuant to State Statutes 274,705 and 932, the Clay County Sheriff’s Office periodically offers for sale to the general public unclaimed lost/abandoned property, unclaimed evidence, seized property and surplus equipment. The agency reserves the right to reject any and all bids and to accept only bids that in its best judgment are in the best interest of the county and/or the sheriff’s office. The Clay County Sheriff’s Office uses the services of the auction company Public Surplus. You can view available auction items by visiting the Public Surplus website. Once a need is identified, acquisitions made through the Clay County Sheriff’s Office require competitive quotes or bids and approvals prior to issuance of a purchase order or contract. A purchase order is the primary means of procurement. Vendors should always make certain that a purchase order has been issued before making deliveries of service or merchandise or incurring any expenses with the exception of emergency situations. All bids and request for proposals (RFP’s) are advertised in a newspaper of county wide distribution for at least two consecutive weeks, with the last ad at least 10 days prior to the RFP closing date. All bids and RFP’s must be submitted in a sealed envelope and identified as indicated in the specifications and delivered by mail or personally. All bids will be opened publicly on the date and time indicated in the specifications. Bids received after the specified date and time will not be eligible. The Clay County Sheriff’s Office is exempt from the payment of all federal excise taxes and sales taxes of the state of Florida. The sheriff’s office will provide exemption certificates and/or provide our Tax ID Number upon request. Public purchasing officials are required to maintain high standards of ethics and conduct and maintain complete independence and impartiality in dealings with vendors, both in fact and in appearance, in order to preserve the integrity of the competitive process and to ensure there is public confidence that contracts are awarded equitably and economically. The following are excerpts from Chapter 112, Part III, Florida Statutes, Code of Ethics for Public Officers and Employees. No public officer, employee of an agency, or candidate for nomination or election shall solicit or accept anything of value to the recipient, including a gift, loan, reward, promise of future employment, favor or service, based upon any understanding that the vote, official action, or judgment of the public officer, employee or candidate would be influenced thereby. No public officer or employee of an agency or his spouse or minor child shall, at any time, accept any compensation, payment, or thing of value when such public officer or employee knows, or, with the exercise of reasonable care, should know, that it was given to influence a vote or other action in which the officer or employee was expected to participate in his official capacity. In order to avoid the possibility of any misunderstandings regarding compliance with the law and regarding any appearance of impropriety relative to the competitive process for awarding contracts, it is respectfully requested that vendors refrain from offering anything of value to staff of the sheriff’s office. If you would like to be added to our vendor list or have any questions, please email purchasing@claysheriff.com and include your business name, product and contact information. The Clay County Sheriff’s Office Civil Section carries out the sheriff’s statutory responsibility for the service of process and execution of writs. These judicial process documents originate from the courts, governmental agencies and private attorneys in Florida and throughout the United States. 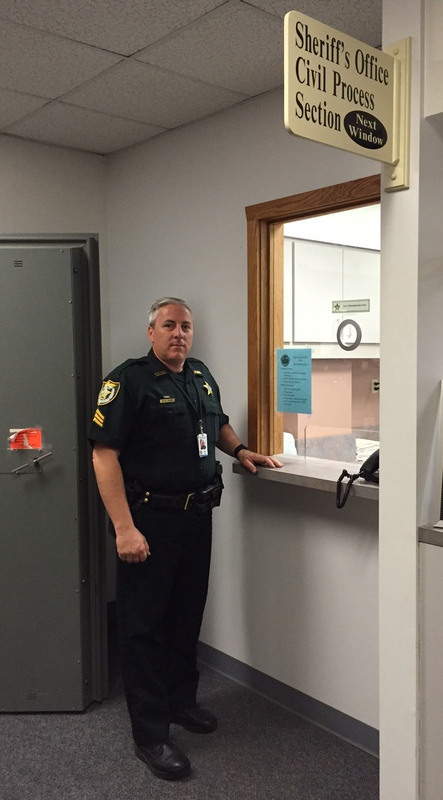 The staff also enforce levies and conducts sheriff’s sales to aid in the collection of money judgments. For more information about having your documents served, call our Civil Section at (904) 213-6020 (M-F, 8 a.m. to 5 p.m.) or visit the Civil Section front counter located in the Clay County Courthouse at 825 N. Orange Ave. in Green Cove Springs. The Clay County Sheriff’s Office serves foreign process under Florida State Statute 48.031. For process that needs to be served outside these guidelines, you will have to contact a private process server. This private process server will need to obtain proper authorization from the court to serve such process within Clay County. Please note that the Civil Section does not provide legal advice or assist in the preparation of documents. Fees for service of process are fixed by Florida State Statute 30.231 and are nonrefundable. At a minimum for process, you must provide the Civil Section with the original process or a certified copy with a copy for service for each individual, and the best address available where the document is to be served. The Civil Section files all returns with the Clerk of Court in which it was filed. The petitioner should check online or in person with the specific clerk of court in which he/she filed paperwork to discover whether the process has been served. If our civil specialists have time, they may check the status on a pending paper for service and provide you with that information. Personal checks are not accepted through the mail. Only cashier checks or money orders are accepted through the mail from private individuals. Never send cash through the mail. Method of payment for process brought into the Civil Section is cash (exact amount), certified check or a money order. We only accept checks from businesses. All checks, cashier checks and money orders must be made payable to the “Clay County Sheriff’s Office.” Documents for service not properly issued or those with incorrect fees or incorrect payee on them will be returned. For more information about Civil Process in Clay County, please visit the civil section. *Please note: Under Florida Law, email addresses are public record. If you do not want your email address released in response to a public records request, do not send electronic mail to this agency. Instead, contact our agency in writing or by phone.